BloomBoss LLC is located in Farmington, Massachusettes. This is a plus for many growers that are looking to home grow with products manufactured in the USA. BloomBoss reveals where they get the LEDs that they integrate into their units. Not all LED grow light companies reveal the LED manufacturer, often relaying that the information is part of proprietary data that can’t be revealed. BloomBoss is not a company that withholds this information which is reassuring. BloomBoss reports that all of their red LED chips are manufactured by Epistar, and all of the blue and white LED chips are manufactured by Bridgelux. 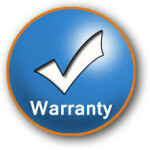 All of the LED grow lights come with a warranty. BloomBoss aims to offer high quality LED grow lights at reasonable prices. The hassle free warranty gives the grower the option to return a purchased grow light that may need repaired or replaced at no cost to the customer. BloomBoss is a reputable company that offers several different types of LED grow lights. The LED grow light of focus in this post is the BloomBoss 90 watt UFO. Please review the rest of this comprehensive LED grow light review to support your search for the best LED grow light unit. Epistar: Epistar is a provider of the red LED chips that BloomBoss integrates into its grow lights. Epistar was founded in 1996 and is a global supplier of LED products. It is located in Hsin-chu Industrial Park in Taiwan. For almost 2 decades, researchers at Epistar have worked to design an LED chip that is optimally efficient. Epistar specializes in the production of red LED manufacturing and their work to improve efficiency has reduced the heat output and thus increased the overall lifespan of their LEDs. 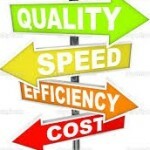 This ultimately leads to cost reduction, not just for their LEDs, but for the products that utilize their LEDs as well. In this way, BloomBoss and their consumers, benefit from Epistar LED chip utilization. Bridgelux: Bridgelux is located in San Francisco, California and has been recognized as one of the fasted growing light source developing companies in the region. Bridgelux does business around the world and was recently recognized by the San Francisco Bay Times. 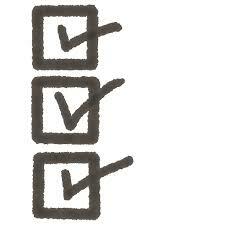 The recognition is based on fiscal revenue which means that their sales continue to increase. The positive trend-line for sales is one sign that the company is producing a successful product which consumers find worthy. Bridgelux is well respected and utilized by many for their LED technology needs. The company specializes in high performance COB arrays which allow the LEDs to run with optimal efficiency. The BloomBoss 90w UFO LED grow light is unique in that it offers a special blend of light that supports plant growth during all developmental stages. Red and blue light wavelengths are integral in the spectra of light that the BloomBoss 90w LED grow light emits. A small ratio of full spectrum white light is also included to enhance PAR while closely aligning with the wavelengths of light that research shows is most beneficial to plant growth. The light is all inclusive which makes the BloomBoss 90w UFO stand alone product. The BloomBoss 90w UFO LED grow light is designed so that an indoor grower does not need to purchase other lights to boost vegetative growth or flowering yield. The BloomBoss UFO can be used independently due, in part, to the proportion of white light included in the spectra recipe. BloomBoss reports that the addition of the white light polishes off their product so that it emits a perfectly balanced recipe of light to optimize PAR during indoor growing. Blue and red light is vital for plant growth development and the BloomBoss 90w UFO includes light wavelengths in the specific ranges listed below. Most studies of plant photosynthesis reveal that plants benefit most from the light spectra between the wavelengths of 400 and 700 nanometers and that blue and red light spectra is absorbed and utilized more than any other wavelength. Blue light supports vegetative growth during a plants growing process and research has shown that blue light mixed with red light can produce a higher plant biomass. Specific red light wavelengths support flowering during a plant’s growing process. The blue and red mixture closely aligns with the Action Spectrum for chlorophyll producing plants. Specific blue light supports vegetative leaf growth during the plant’s growing process. 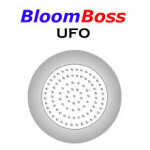 A smaller proportion of full spectrum white light is emitted by the BloomBoss LED UFO. Full spectrum light covers the electromagnetic spectrum, or all wavelengths that plant’s utilize to a degree. Sunlight is considered full spectrum and so adding the small amount of full spectrum white is intended to mimic the light emitted by the sun. The small amount of white light produced by the BloomBoss 90W UFO is intended to feed the plant the additional wavelengths it needs that are not provided in the red and blue range, all without producing much excess energy. This is why the addition of the full spectrum white is at a lesser proportion compared to the blue and red proportions. When integrated into an LED grow light intended for indoor horticulture purposes, the plants grown under the light tend to more closely resemble plants grown outdoors in natural sunlight. This is why the BloomBoss LED can be more efficient than other LED grow lights. Not all LED grow lights include a proportion of full spectrum white light. Pros: The BloomBoss UFO is small and versatile and can be utilized in small spaces during indoor grow scenarios. It can be used as the primary lighting for plants being grown indoors due to the recipe of light which includes red, blue, and full spectrum white. It can be run while consuming minimal amounts of power. Given that its rated power consumption is just 90W, it will not consume as much power as other grow lights on the market. The BloomBoss 90w UFO is on the lower end of power compared to the vast number of grow lights available on the market right now. The LEDs integrated into the grow light are 1 watt LEDs. It should be noted though that even at 90W of power, the BloomBoss does offer a unique Spectral “recipe” of light that focuses just the right type of light that growing plants need. So, even though the power output is on the lower end, the light being emitted is efficient and effective. Generally though, the light penetration stemming from 1 watt LEDs may penetrate less than higher wattage LEDs. The three year warranty the BloomBoss offers applies to the Bloomboss FUSION 600, the BloomBoss FUSION 400 and the BloomBoss UFO LED grow lights. It should be noted that any unauthorized modifications to the lights will void the warranty. Otherwise, BloomBoss will either repair or replace the unit and then pay to ship it back to the owner. The light is generally less expensive than other LED grow lights that are full cycle and emit light that covers all stages of a plant’s grow process. The light has very little heat build up and the integrated fan is relatively quiet. Some say it sounds like the fan on your computer when it kicks on. Growers are happy with the full spectrum white light added to this grow light. Some other grow lights only have red and blue wavelengths so the added white light is a bonus that is worthwhile. Some growers report finding an optimal light coverage that is less than 9 square feet. Multiple reports relay that a coverage area of 2 -4 square feet seems to work better. The BloomBoss 90w should be utilized by an indoor grower focusing on a small number of plants. The UFO has a nice spectral blend of colors that hit all the wavelengths necessary to spark proper plant development throughout the plant’s life cycle. The unit has an efficient design and is relatively easy to install. Set-up time is minimal since additional cooling and ventilation equipment is not necessary. It 90 Watts of power emitting an optimal blend for both growing and flowering of plants. It is useful for covering one large flowering plant or several small vegetative plants. Utilizing the 90w UFO from BloomBoss in this way can help you grow big, at home. I hope this comprehensive LED grow light review helped you to determine which LED grow light is the best LED grow light for your needs. Now its time for you to decide if this unit fits your needs. Grow well!